Pierce the skin of the squash and microwave for 1 minute to make it easier to cut. Cut the butternut squash at the base of the neck; you will use the bulb to make your filling and the neck to make the “noodles.” Cut both the neck and bulb portions into halves vertically and remove any seeds. Spray the squash bulb halves with olive oil spray and place on a large baking sheet, flesh side down. Roast 40 minutes, until flesh is fork-tender. Meanwhile, prepare the squash “noodles” with the squash neck. Peel the neck and thinly slice it into wide, lasagna-like strips. A mandolin will make slicing the squash much easier, but you can also use a knife. Line two standard size baking pans with aluminum foil. Spray the pans with olive oil spray and lay the squash “noodles” in the pans. Spray the noodles and bake alongside the squash for the filling for the last 10 minutes, until the squash noodles are pliable. Remove the squash bulb and noodles from the oven. Now make the filling. When the squash bulb is cool enough to handle, peel and dice. Weigh 1½ pounds (approximately 4 cups of squash) and transfer to a food processor. Add butter, nutmeg, salt, and white pepper. Pulse on and off until mixture is smooth, 15 to 20 seconds, scraping down sides of bowl as needed. Reserve ½ cup for the sauce and set aside. Transfer the rest of the mixture to a bowl, and stir in cheese, egg yolk, and cookie crumbs. Let filling sit until no longer warm—15 to 25 minutes. Spoon filling into a reseal-able plastic bag. Refrigerate while you cook the pasta and make the béchamel sauce. Next, cook the pasta. In a large pot of boiling salted water, cook the pasta until al dente—about 8 minutes. Drain. Now make the béchamel sauce. In a small saucepan, heat the milk over low heat until warm. In a separate medium, heavy-bottomed saucepan, melt butter over low heat. Add salt, white pepper, and nutmeg. Add the flour, raise the heat to medium and cook, stirring constantly, until smooth, pale golden, and nutty. Gradually add the warmed milk, stirring constantly. Simmer the sauce until it is lightly thickened and coats the back of the spoon—about 5 minutes. Set aside. Now you’re ready to assemble the manicotti. Preheat the oven to 375°F. Cut a corner off the bag with the squash filling and pipe filling into the pasta tubes. 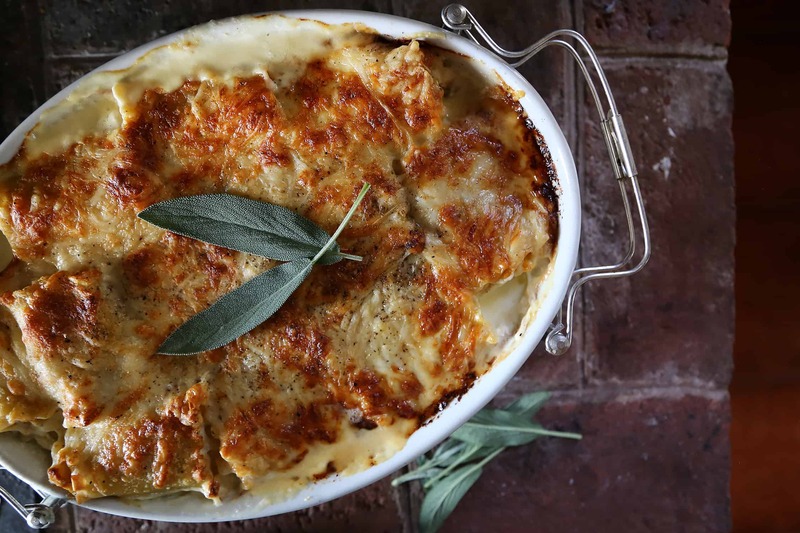 Grease a loaf pan, line with parchment paper, and spoon a thin layer of béchamel onto the bottom and arrange filled pasta tubes in a row one layer deep. Sprinkle with some of the mozzarella and Blaak cheeses, then add another thin layer of béchamel. Follow with another layer of filled pasta tubes. Repeat layering until you have filled the loaf pan. You should have some béchamel sauce remaining, which you will use to plate the manicotti. Once you have filled the pan, top with a final layer of squash “noodles.” Spray with olive oil spray. Cover with aluminum foil. Bake for 45 minutes. Let rest 15 minutes, then run a rubber spatula gently around the pan to loosen. Turn upside down onto a platter and gently remove paper. Cut into slices. Add the ½ cup reserved squash purée to remaining béchamel sauce and mix well. Heat the sauce for plating. Ladle some sauce into each pasta bowl, place a slice of manicotti on it, and serve with grated Parmigiano cheese. NOTE: To simplify this recipe you may use pre-packaged peeled cubed butternut squash that you roast and puree or frozen butternut squash purée available at most supermarkets. You can also forego the elaborate stacking process and stuff larger manicotti with the squash mixture. If choosing to do this, spoon a layer of sauce on the bottom of a baking dish and place cooked and stuffed manicotti in a single layer over the sauce. Spread béchamel-squash sauce over the manicotti and sprinkle grated cheese over the pasta, then bake until hot and bubbly. Oh wow this looks so good! Can’t wait to try this!